My younger son T is a long distance runner. None of us know where this skill came from. My husband was a discus thrower and I don't run unless someone is chasing me. T discovered that he loved to run when he was 8. We were at his older brother's soccer practice, and T was bored. I told him to start running laps, and 3 miles later he was still going with a big smile on his face. Since then he has run cross country and track, first for a local running club and then for his middle and high school. He has natural ability, but has worked very hard to improve his form and technique. Running is his passion, but there have been lots of highs and lows. The last few months have been frustrating for him. He had hit a plateau and nothing seemed to be helping - not extra training, or changing his diet, or practicing relaxation techniques. 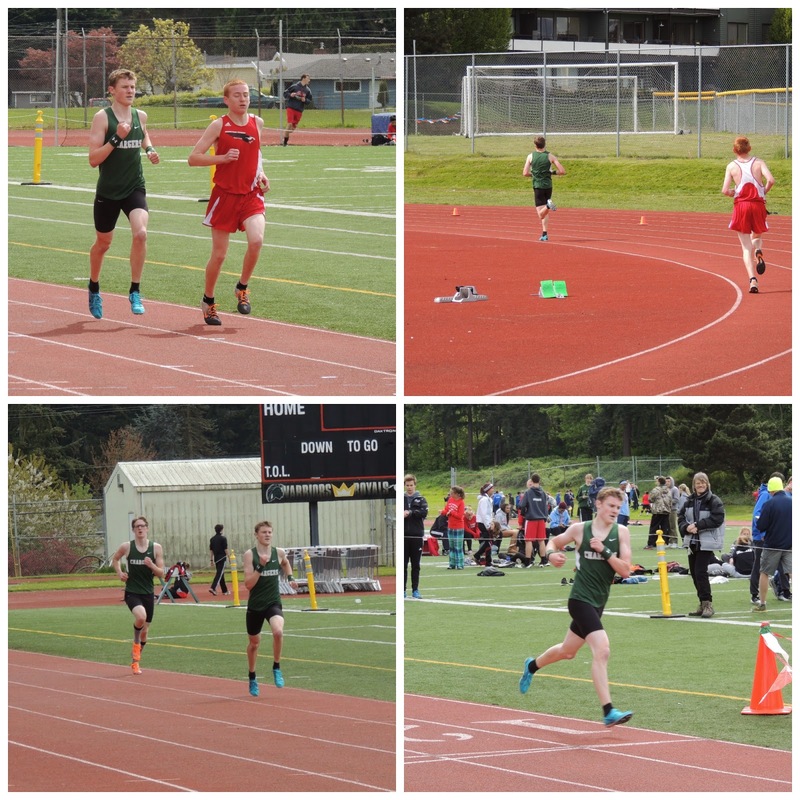 His high school team was entered in an invitational track meet, where T would run the 2 mile. The day started out sunny, but rain clouds were gathering. As it got closer to race time, we could see that T was looking relaxed and ready. His goal was to break 11 minutes and hopefully get a personal record. Did anyone else notice the person laying face down on the field? With the race about to start, T looked focused but I was a nervous wreck. When he came by us on the first lap, I knew it was going to be a special race. He looked strong and centered, and his stride was perfect. With only 800 meters to go, I knew he was going to surpass his goal. As T crossed the finish line, I could see how excited he was. All the months of hard training were paying off in this moment. Even though he was exhausted, he was elated and proud, and so were we. It was a great day for a 10:44. I never got into running but I like to walk. Good luck to your son on his running journey. Thank you! It's definitely a journey. WOO HOO!! There is nothing as great as seeing your kid's hard work pay off! What a great time drop for T! I'm happy for him!! It must have been fun to watch! It was so much fun. He's been through a lot of disappointment lately, so it was such a great day! How exciting! My husband ran cross-country in high school and college, and to this day runs races occasionally and stays very interested in the news from the professional running world. It's a pretty healthy hobby to be interested in! Thanks for the nice comment! Once a runner, always a runner it seems.